Corvus corax, also known as the common raven is one of the most intriguing organisms on the planet. First documented by Carl Linnaeus, this versatile and amazing creature is geographically widespread, and one of the most recognizable birds in the world. The scientific name for the common raven is derived from a Latin base. In Latin, Corvus corax means "raven". Within the scientific community organisms are scientifically named using binomial nomenclature, so that no matter what language you speak or no matter where you live in the world, Corvus corax will always refer to this organism. The common raven (Corvus corax) is an extremely unique creature within the animal kingdom. Although often confused with other members of the Corvidae family there are multiple characteristics that distinguish this fantastic creature from other black birds. The largest member of the Cordivae family as well as the largest song bird in the world, the common raven can grow to a size of up to 69 cm and a mass of 689 to 1,625 g when an adult. Adult male and female common ravens are very similar in appearance; the only difference is that females are slightly smaller than males (Boarman 1999). 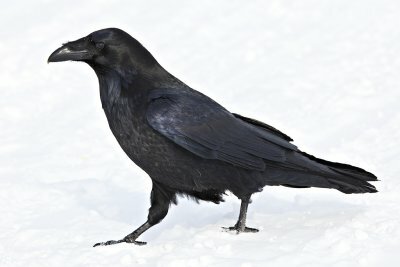 Although differing in size, both male and female common ravens have relatively long life spans, they can on average live to be thirteen years old in the wild (National Geographic 2012). In captivity, some common ravens may have longer life spans; common ravens have allegedly been seen to live upwards of forty years or more (Boarmen 1999). Other descriptions that distinguish this beautiful organism include its completely black plumage, long black feathers protruding from the throat and chest, as well as a large bill with a curved culmen (Goodwin 1986). 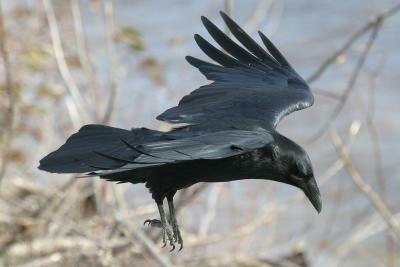 With long pointed wings, the common raven is very distinguishable while in flight, using this adaptation for aerobatic and high elevation maneuvers (Schwan 2008). These are general physical characteristics of the common raven; variances in this species occurs as adaptations for larger size and different beak sizes are needed in differing habitats around the world (Goodwin 1986). Although most generally distinguishable due to physical appearance, the common raven has many behavioral characteristics that set it apart as well. Extremely intelligent, this bird has unique vocal skills and incredible problem solving abilities which makes communication between other members of this species possible (Schwan 2008). 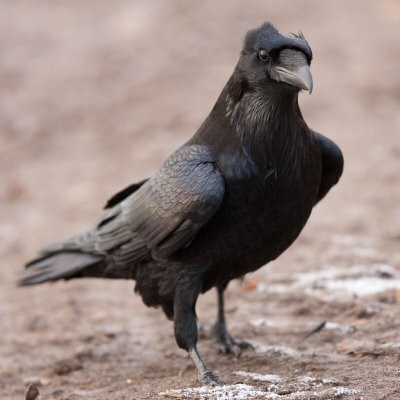 This intelligence and distinctive vocal communication amongst Corvus corax is one of the most general, but also extremely important characteristics that sets it apart from other birds as well as creatures within the animal kingdom. Go to Classification to see where the common raven fits into the grand scheme of things! To learn about other captivating organisms, go to MultipleOrganisms.net! Go to Encyclopedia of Life to learn more about Corvus corax! Go to National Geographic to learn even more about Corvus corax! The main banner picture of Corvus corax flying is courtesy of Paul Lantz!